Prepping a bike for race weekend requires more than sticky tires. 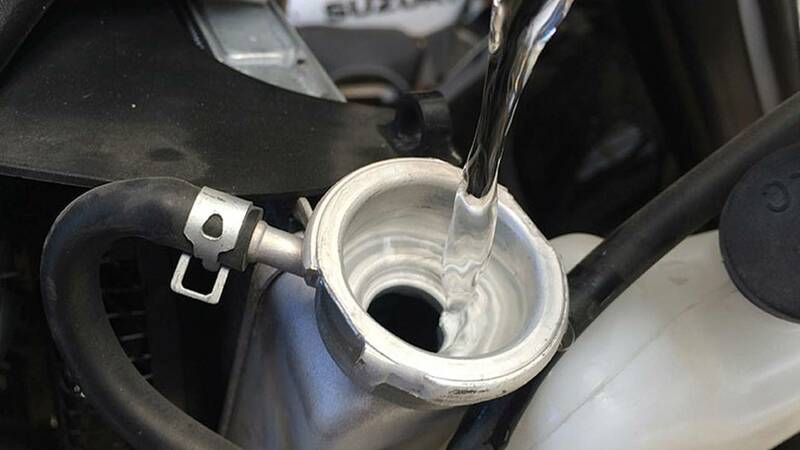 Here is a how to guide on a proper race ready coolant flush. Proper cooling system maintenance is one of the most crucial procedures conducted on a water-cooled internal combustion engine in order to maximize the life and performance of the machine. The same process is critical before heading out to the race track as well. It is very important to have your bike fully prepared in order to not only be compliant with track regulations and ensure proper operation of your machine, but it is also vital for your own safety. Luckily, this is one of the most straight-forward jobs in motorcycle maintenance requiring very little time, effort and expertise. Most track day organizations and racing leagues prohibit the use of traditional glycol-based coolant or anti-freeze solutions. 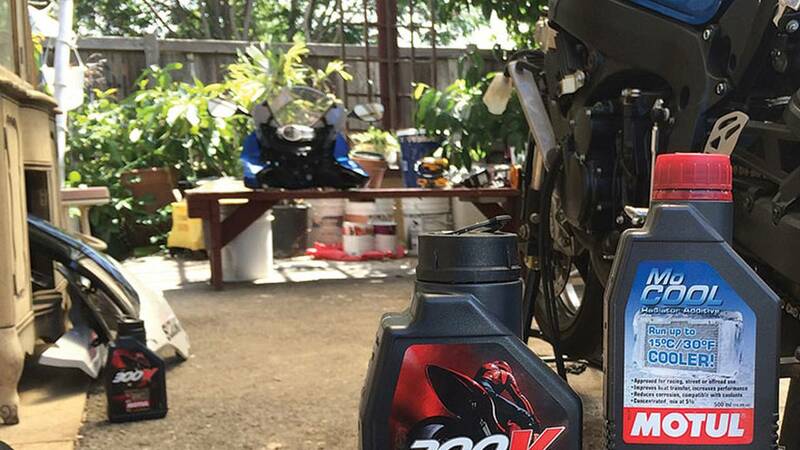 These products can be extremely dangerous when spilled on the race track surface and make clean-up difficult. Additionally, typical coolants are designed with a heavier emphasis on extending the life of the cooling system components while keeping the engine temperature below the maximum tolerance during normal operation. These coolant products are also formulated so they do not freeze when ambient temperatures drop below freezing (hence the name “anti-freeze”) resulting in cracked blocks, coolant lines, impeller housings or other components during fluid expansion as the coolant undergoes phase shift from liquid to solid during a freeze. This is not an area of concern at most race tracks where these freezing temperatures are not encountered. Furthermore, reducing the operating temperature of the engine extends the life of the overall machine while allowing maximum performance output to be achieved. This is where a cooling system additive comes in and addresses all of these issues. 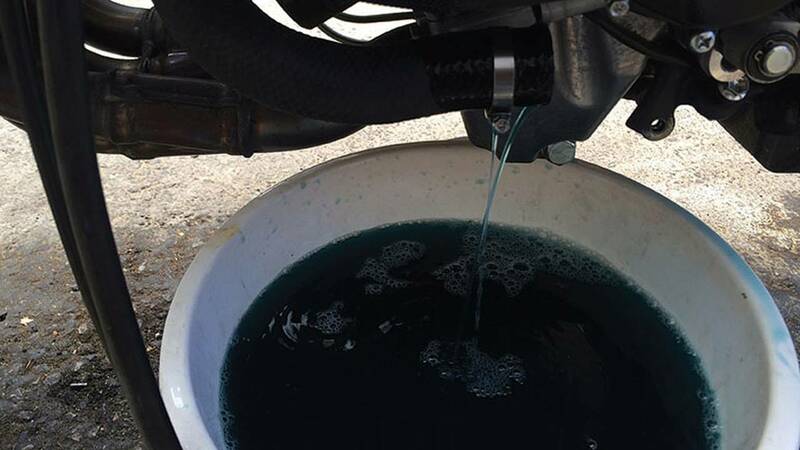 Whether flushing your aged coolant out for a fresh batch of generic anti-freeze or track-prepping your bike with a racing coolant additive, the following procedure will guide you through this important yet painless process. 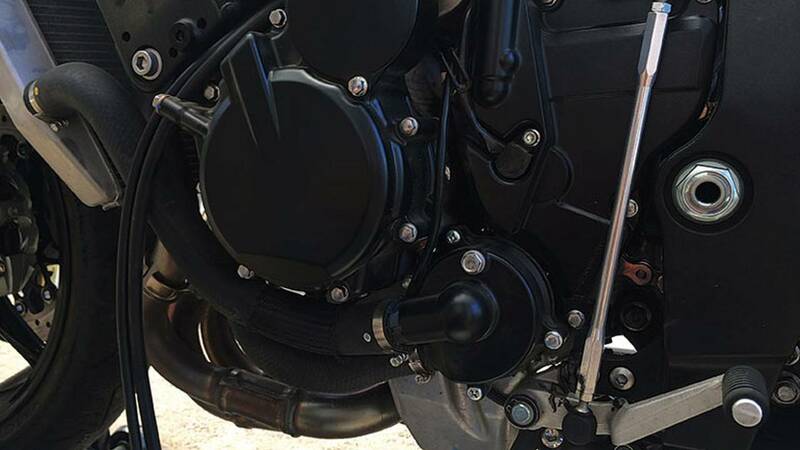 Every bike is different, but for the most part, the drain bolt for the coolant is typically located on the lower portion of the impeller cover. The impeller cover is usually pretty easy to identify by the two main coolant lines attached to it. The drain bolt also generally has a copper washer further helping with identification. However, when in doubt, consulting the service or even owner’s manual will always provide a quick answer. This is a much easier component to identify. Though on some fancy fairing bikes the upper cowl and/or air ducts have to be removed to access the cap, this is usually a tough part to miss on top of the radiator. Ensure the engine is cold before removing the radiator cap to prevent any pressure build up causing hot coolant to be sprayed out of the radiator cap opening. Place a drain pan with a capacity of at least one gallon under the drain bolt located in step one. With the radiator cap removed from the previous step, back the drain bolt out until a steady flow of coolant is draining from the engine. Removing the radiator cap equalizes pressure in the system allowing for the coolant to drain quicker. Once the heavy stream has slowed to a very light drip, tighten the drain bolt back up with just your fingers. Using distilled water, pour around half of a gallon of clean water into the system through the radiator cap opening at the top of the radiator. Next, back the drain bolt back out again allowing the fresh water to drain out into the drain pan. This helps flush residual coolant and sediment still trapped in the cooling system. Once the fluid has drained from the system again, tighten the drain bolt to the manufacture-specified torque specification. It is also important to drain the old coolant out of the reservoir tank, typically located next to the radiator. This reservoir captures excess coolant when system temperatures increases to the point where pressure is built up, activating the spring-loaded valve built into the reservoir cap and boiling coolant over into the bottle. When coolant temperature and system pressure is reduced, a vacuum is created returning coolant back into the system. If old coolant is still in this reservoir, it will be introduced back into your freshly-flushed coolant during engine operation. 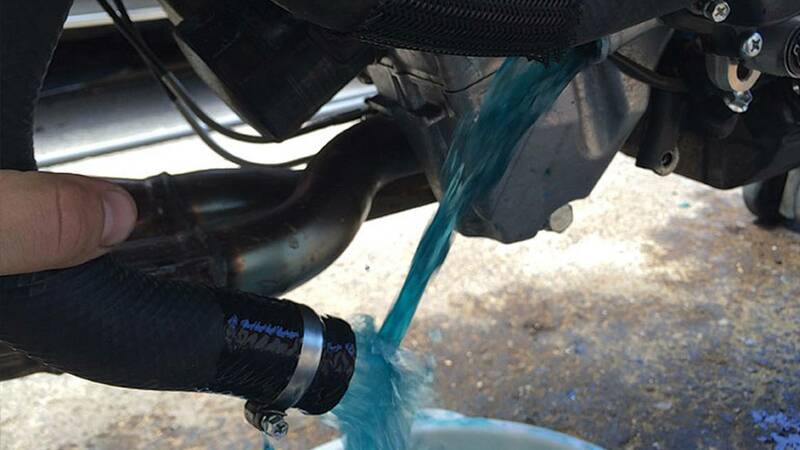 Drain the coolant out of the reservoir by removing the drain hose and draining into your catch pan. Once drained, reconnect the drain hose. This is where the user can decide whether to fill the system with fresh traditional antifreeze or a mix of distilled water and racing coolant additive if the bike is bound for the race track. Non-glycol based coolant additives generally only require a few capfuls of the solution with the rest of the cooling system simply filled with basic distilled water. Running a water-rich mixture in the cooling system reduces engine operation temperatures while still providing component protection and lubrication with the small dose of coolant additive. Again, an antifreeze formula must be used if the bike is expected to be exposed to freezing temperatures (whether running or stored away). Don’t forget to replenish the reservoir bottle drained in the previous step with the selected coolant formula. Once the system has been filled with the new coolant mixture, reapply the radiator and coolant reservoir caps. Then reinstall any other parts of the bike removed to access the cooling system. Fire the motor up and allow it to heat up to normal operating temperature. Inspect the areas of the cooling system that were accessed to flush the coolant such as the drain bolt and radiator cap to ensure no leaks have sprung. There may be some steam coming off the engine if any coolant was spilled or splashed onto the exterior surfaces. This is nothing to worry about as the heat of the engine will burn off any residual fluid. 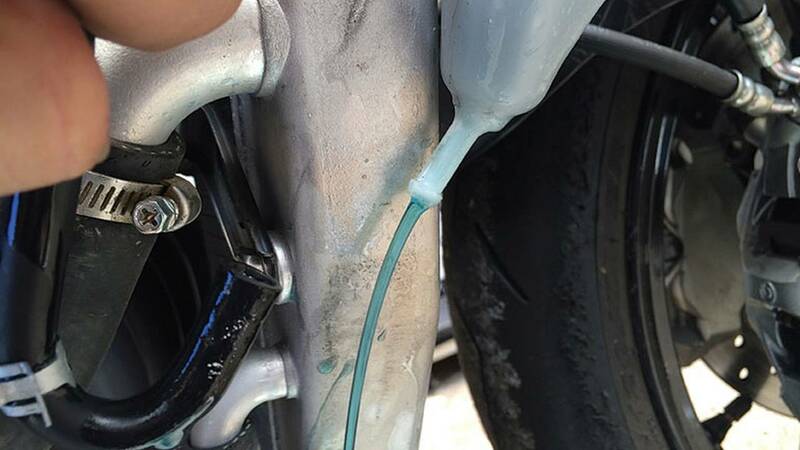 Also make sure to clean any coolant that made its way onto the tires, as this will drastically reduce traction and produce extremely dangerous riding conditions. 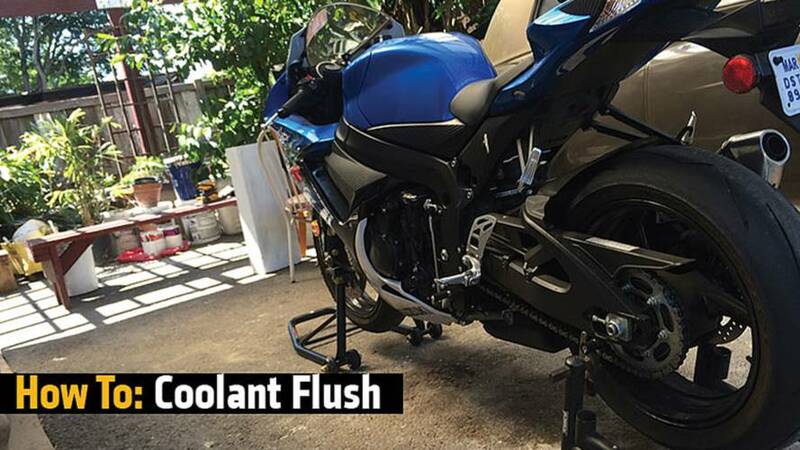 In order to further flush the old coolant out of the cooling system, repeating the steps above after the bike has been warmed up to normal operating temperatures is a good idea. This is especially important if attempting to flush all glycol-based coolant out of the system before taking the bike to the track. When the coolant is flushed out of the system while the engine is cold (as it should), old coolant is trapped in the coolant channels and “jackets” around the cylinders. This coolant cannot be drained through the drain bolt because the cold thermostat shuts the valve that would otherwise allow the coolant around the cylinders to join the rest of the system. Once the engine is warmed up to normal operating temperatures, this thermostat valve opens and mixes the new coolant formula with the old. Though it is nearly impossible to evacuate all of the old coolant, a second system flush further dilutes any residual fluid.